Deer Park is a large, newish estate on the north-west of the village, beyond the Parsonage Road estate and the Medical Centre. Streets include Badgers Copse, Deer Park, Fawn Rise, Mallard Way, Jubilee Close, Meadow Drive, Hudson Way, Stag Close, St. Peter's View and North Meadow. Fawn Rise 1-3: Three photos taken in April 2016 at the beginning, middle and end of Fawn Rise, which runs through the centre of the estate. 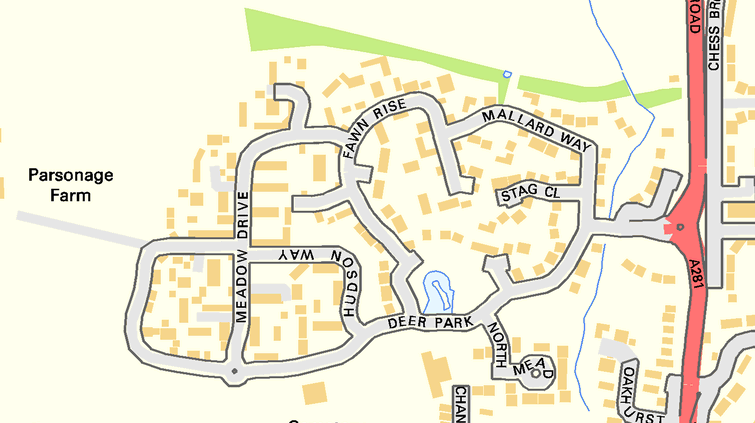 Jubilee Close: This cul-de-sac runs east from the centre of Fawn Rise. Also from April 2016. Badgers Copse: Badgers Copse isn't marked on the map above, but you can see the road just inside the main A281. Turn into deer Park from the roundabout on the main road and Badgers Copse is to your right before the road splits left in to Deer Park and right to Mallard Way. A view from late August 2017. Stag Close: This is a cul-de-sac running east off Mallard Way. A view from late August 2017. Mallard Way 1-2: Mallard Way runs along the north side of the estate and joins up with Fawn Rise. Two views from late August 2017. Meadow Drive: Meadow Drive borders the estate on the east. A view from late August 2017. Hudson Way 1-3: This road winds from the middle of Meadow Drive to Deer Park. Three views from late August 2017. Jubilee Close 1-4: Jubilee Close, though a cul-de-sac, has houses running in all directions. Here are four views from late August 2017. North Meadow 1-2: This was one of the first roads to be completed in Deer Park, at the same time as the Health Centre. A view from late August 2017. Two views from late August 2017.